Gifts from the Pirates: "The English contribution to world cuisine - the chip." 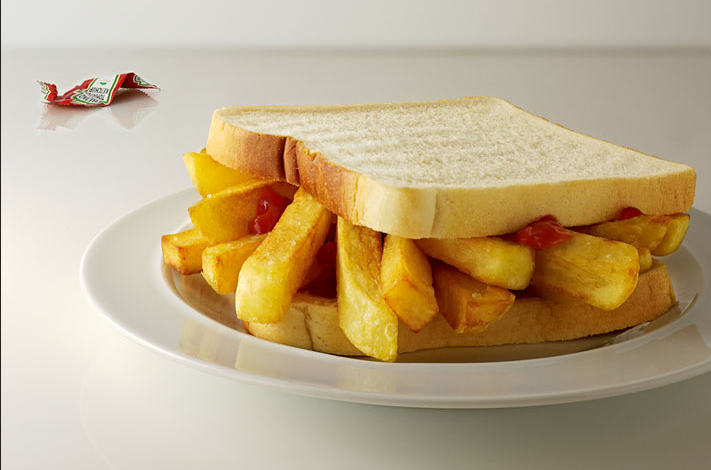 "The English contribution to world cuisine - the chip." It doesn't happen all that often but tonight i haven't been in a great mood, there's lots of things playing on my mind and to be fair ive been a bit of a grump. I decided to have a bath to relax and try and switch off. While i was in there Mrs M came in with a chip butty. I have an issue with eating in the bath i always just thought that it was a bit scutty but Mrs M said i need to embrace bath time eating, as it's Mrs M's guilty pleasure, when I met her she would always take a bath with food... (we've come a long way since then, the trifles in the bath and yoghurt pots on the edge of the bath..... ) so, i decided to give it a try. Well i felt liberated! It has all the same benefits as eating at a table like curing a hunger but has the added bonus of you being able to quickly clean yourself off when you drop something down you, which is even more beneficial when you have a beard, genius. I may have a roast dinner in there tomorrow.